I Was Wrong. ~ The Bucky Channel - The World of Sports from Wisconsin's Perspective. Home » Aaron Rodgers , Chicago Bears , Green Bay Packers , Lions , Mike McCarthy , Minnesota Vikings , NFC North , Remember the Titans , Sports Bubbler » I Was Wrong. 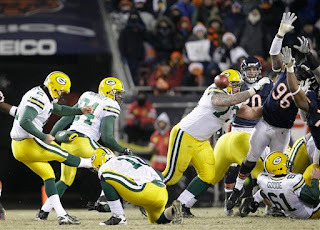 Yesterday I wrote a nice little column about why a Packers fan might root for the Bears in their Monday Night showdown. The reasoning was simple: If a Bears win ultimately gets them into the playoffs over the Vikings, then I would be able to stomach a Packers loss. When it comes down to it, I would still rather see the Bears in the playoffs than I would the Vikings. I just hate the Vikings more, and I don't see that changing. But now that I live back on the east side of the state, it's actually more Bears fans that creep into my territory than it is Vikings fans. While I may hate Minnesota more than Chicago, I have no problem saying that I despise both of their fans with the same amount of hatred. This team, this season has really become laughable. Seventh loss by four points or less. As the game continued to progress, you knew exactly what was gonna happen. No killer instinct on offense, play for the field goal. They outplayed the Bears virtually the entire game, but can never put them away. Packers gift wrapped an early Christmas present for the Bears last night at Soldier Field. You can look at Special Teams and Defense, but its something I've been saying since the pre-season: The Offensive Line is not very good. They're soft and can rarely man-up against anyone. That is the biggest reason the Packers are not in the playoffs. And as ACME Packing Company points out, the Packers have been outscored by a combined total of 6 points (194 to 200), but their record is 1-7. I mean, was there really any difference between Monday night's 20-17 overtime loss to the Bears compared to any other game this season? The only difference was that someone else found the way to blow the lead after Aaron Rodgers put them in (field goal) position to win the game. When it comes down to it, this season isn't going to be remembered for the play of Aaron Rodgers, and if that other guy would have done better. It's going to be remembered for how big of a joke this Packers team has become. We'll remember how Mike McCarthy somehow became twice as conservative as Mike Sherman. We'll ask ourselves how Rodgers was even capable of having the season he's having when the offense line has been blocking like Ray Budds from "Remember the Titans". And we'll remember the first five-game losing streak by this team since 1990. But the Packers have one game left. One game to save any sort of dignity you can when you're 5-10. The 0-15 Lions come into Lambeau next week, and basically every Packers fan I know has been predicting a Packers loss since Thanksgiving. I could see it going both ways because a) the Lions are that bad but b) I don't know if the Pack can recover from another heartbreaker like the one against Chicago, especially with them being a division rival. I grew up in Milwaukee and hate the Bears as much as I hate the Cubs. Then I went to college an hour away from Minneapolis, where half the students are Vikings fans. Then I found a new hatred in the Vikings. I wish the Lions had a chance to win the division, as I would rather root for them. However when you hate something as much as I hate the Vikings and the Bears, it doesn't matter anymore, I just want the Packers to win and let whoever defaults as the NFC North representative in the playoffs lose in the first round.